First and MSc degrees in Chemistry from the Technion. PhD in Computer Science and Biological Chemistry from the Weizmann Institute. Participated in the Technion Excellence Program: 1993 – 1996. Kobi took basic courses at different departments, e.g. Infi 1/2 with the Math department, and Physics 1/2/3 with the Physics department. He also took a number of courses in biology (genetic engineering) and worked in the lab. During his Master studies, Kobi worked under the supervision of Prof. Timor Baasov on the mechanism of the enzyme Kdo8P synthase, a key drug target for the new generation of antibiotics. He took part in the ongoing project that aimed at designing antibacterial drugs. In parallel, he participated in the effort to uncover catalytic properties of natural and synthetic polysaccharides. After obtaining his MSc degree, Kobi moved to the Weizmann Institute to work on biomolecular computing with Prof. Ehud Shapiro. Together they built a DNA-based molecular finite automaton, a simple computing device. Later they demonstrated a potential utility of the automaton as a diagnostic tool. 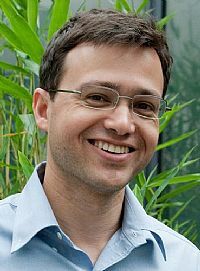 After graduating from the Weizmann Institute, he became a Bauer Fellow and a group leader at the Center for Systems Biology at Harvard’s Faculty of Arts and Sciences. His work was dedicated to developing biological computers that operate in human cells. Do you have recommendations to the students enrolled in the program and to future candidates? Do not be afraid to take risks and act independently, but listen carefully to your mentors. Today (2018): Associate Professor with tenure, Department of Biosystems Science and Engineering (D-BSSE), Swiss Federal Institute of Technology (ETH Zurich).